Credit: M. Ribezzi-Crivellari et al. Maxwell’s demon is a machine proposed by James Clerk Maxwell in 1897. The hypothetical machine would use thermal fluctuations to obtain energy, apparently violating the second principle of thermodynamics. 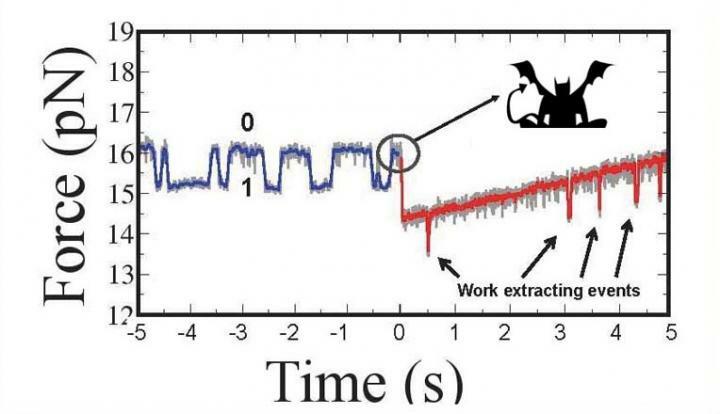 Now, researchers of the University of Barcelona have presented the first theoretical and experimental solution of a continuous version of Maxwell’s demon in a single molecule system. The results, published in the journal Nature Physics, can have applications in other fields, such as biological and quantum systems. “Despite its simplicity and the large amount of work in the field this new variant of the classical Maxwell demon has remained unexplored until now”, notes Fèlix Ritort, professor from the Department of Fundamental Physics of the UB. “In this study -he adds-, we introduced a system able to extract large amounts of work arbitrarily per cycle through repeated measurements of the state of a system”. Waiting for such a propitious occasion to get benefits is something we all know. This behavioural pattern is the same of a speculator waiting for the right moment in stock exchange, or a predator waiting for a prey to be near. “From a thermodynamics point of view, that certain intuitive aspect in trying to look for the right moment is what takes more energy. The answer is whether it is possible to get the same energy from the propitious moment than the inverted one in the searching process, i.e. through a thermodynamically reversible process”, notes Marco Ribezzi, researcher at the UB and the School of Industrial Physics and Chemistry (ESPCI Paris/CNRS). “Our experiments demonstrate it is possible to find the right moment, and not very common at the same time, and to use it in a reversible way. These results show the underlying thermodynamic structure to a general problem that can find many applications, for instance, in the field of biology”, notes Ribezzi. According to the researchers, the new version of Maxwell’s demon could have consequences in self-organization and selection processes that occur during evolution of the biological matter. For instance, this device could be relevant in the regulation of biological networks in generation, transmission and transduction of signals through cell membranes. The experimental testing has been conducted in a system of optical tweezers, which enables the manipulation of a molecule each time, in this case a DNA molecule. With the right force on this structure, it is possible to unfold it, but if the force is small enough, the unfolded state becomes rare, so it finds the precise moment it was looking for. When the molecule is in a rare state, it has more energy and it is possible to use it. “The rarer the episode, the harder for us to find it, but the more energy we can get from it”, notes Ribezzi. “The astonishing complexity of the living matter could be seen as the result, over several evolutionary timescales, of a big process of energy extraction in proper environments to store big amounts of information which is hidden by noise and randomness”, concludes Ritort, also member of the Bioengineering, Biomaterials and Nanomedicine Networking Biomedical Research Centre (CIBER-BBN). Within the program Future and Emerging Technologies (FET), this study has been conducted as part of the European project Information, Fluctuations and Energy Control in Small Systems (INFERNOS), with the aim to experiment on the Maxwell’s mechanism at a nanoscale, i.e the creation of electronic and biomolecular nanodevices to follow the principle of Maxwell’s demon.